Home / Columnists/ Why on earth are we not learning? Why on earth are we not learning? The problem of solid waste in Colombo and the suburbs has been a burning issue for many decades. The number of meetings, court proceedings, workshops and symposia and internal and external reports on managing this problem should total out to a sizeable number without any argument. Many an international donor program has had extensive long-term projects running in the country to solve this issue and Colombo has benefitted from those too. There are also a significant number of personnel who have had external exposure visits and short- to medium-term training. There are professional associations and groups who actually have this area as their main concern. Almost all our universities have at least one program in environmental management and solid waste is a mandatory topic addressed. The number of research papers and projects that have been carried out too are significant. Interestingly we have had award winning projects – in composting, too – in operation right in Colombo handling solid waste. Is Colombo jinxed in this particular area? Are we incapable of coming together to solve this in a way that befits a community that plans smart existence? Even when we were presenting a brave new picture to the outside world, we were only cleaning in multiple places quite religiously and dumping in some other place quite unceremoniously. 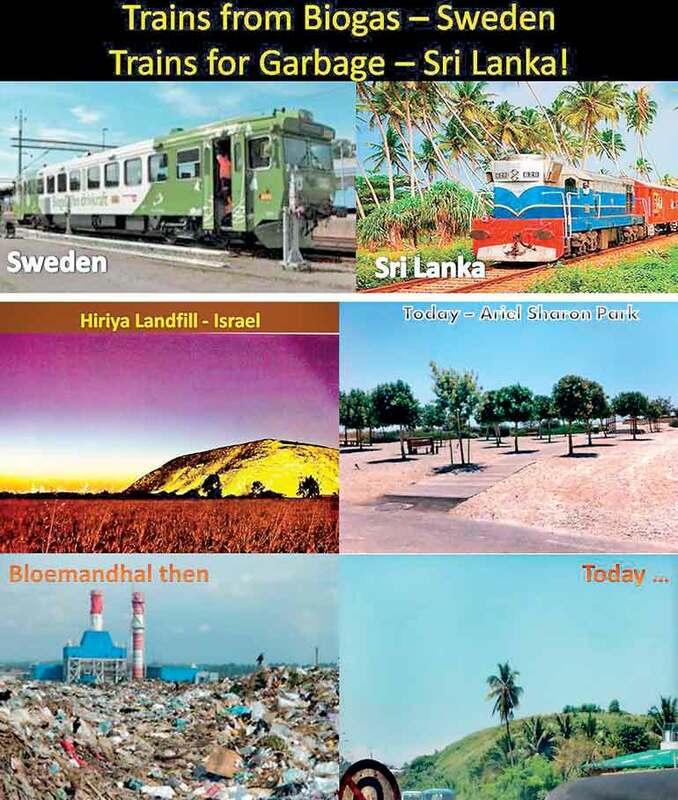 As the rate of dumping is higher than the rate of decay, Colombo became blessed with a number of garbage mountains. When one such mountain at Bloemendhal was closed by a Court order, another started coming up at Meethotamulla and today it is an eyesore to those who are passing by and a hellish heap of matter to those who live close by. Incidents of collapsing garbage piles too have been reported. A rotting stinking heap of garbage next to your house is not something to boast about and the potential health issues are so many and it is a major hazard for the young and the old who may have to spend many more hours per day closer to a site which is offering refuge to waste of all city dwellers, hospitals and institutions. A proposal that came up and was subjected to an Environmental Impact Assessment (EIA) was the transport of all waste generated in Metro Colombo to Aruwakkalu. There was many an issue raised over the potential pollution to an aquifer that is present in the area, the issue of selected site being within the border of Wilpattu National Park, an international Ramsar wetland, potential impacts on an archaeological reservation, etc. Though many an issue was raised with the destination, fewer queries were made over the very process of transfer intended – using the existing railway line from Kollonnawa to Aruwakkalu via Puttalam over a distance of 170 km. A recent news item indicates the revival of the plan to transfer garbage collected at the Meethotamulla dump to Puttalam to begin in three months under a project costing more than Rs. 15 billion. The day-to-day solid waste collection estimated to be around 700 MT will be transferred in sealed containers by train twice a day to Puttalam. This implies train journeys per day totalling over 680 km. The garbage will be pressed (which requires energy) and will be placed in special containers (imported) and sent off (fuel – all imported). Each journey is an expenditure. It is all expense paid one way ticket to solid waste to Puttalam and to be placed in a landfill. There is no real attempt to recycle and there is certainly no attempt to make use of the organic waste. Today in the world the organic waste to landfills is getting banned. Maximum resource recovery is considered the way forward. Proximity principle too is an accepted environmental management practice. We will be blithely breaking all accepted environmental principles of the day. I would like you to consider the picture of the two trains presented here. One from Sweden which is powered by the biogas generated from city’s waste and is serving the city and the region. Our train over a long journey will be burning fossil fuels sourced at considerable expense and will really gain nothing considering waste as a resource. For a country with issues in energy and soil conditioners this is almost a criminal waste of a resource. The potential pathway Colombo should be following for managing solid waste had been written on these columns before. Why don’t we learn from others if we are not creative ourselves? An interesting garbage dump in Israel today is a garden and a tourist attraction! The infamous Hiriya dump which was finally shut down in 1998 served Tel Aviv region for 50 years. Israel requested proposals and 15 artists from Israel and abroad presented proposals and ideas for bringing into reality the Government’s idea of dump to park. Landscape architects triumphed! As one sees what is slowly happening at Bloemandhal even without any plan, one should be thinking about such a process. Creatively developed one could turn these into valuable plots of real estate. We should not be thinking of simple car parks either! The pictures present the story and one could dive deeper to understand the potential for ourselves too. There is also the possibility of collecting some landfill gas to power some operations. These situations are also quite valuable learning opportunities too and the knowledge gained can be translated to knowledge services as Colombo is not the only city with this problem. There is also the need to citizens to play their part, as after all the waste was generated by us in the first place. We just want the Government to solve the issue while we ignore our own responsibilities. That certainly is not the way forward in today’s context and all well-maintained cities demonstrate responsible citizen behaviour. When we land in such cities, our behaviour too is impeccable! Instead of tackling the issue of irresponsible behaviour, the State has responded to schemes such as mass burn or incineration too, opting to get some energy out in the process. Little do we understand the enormous consequences of air pollution control in such processes. 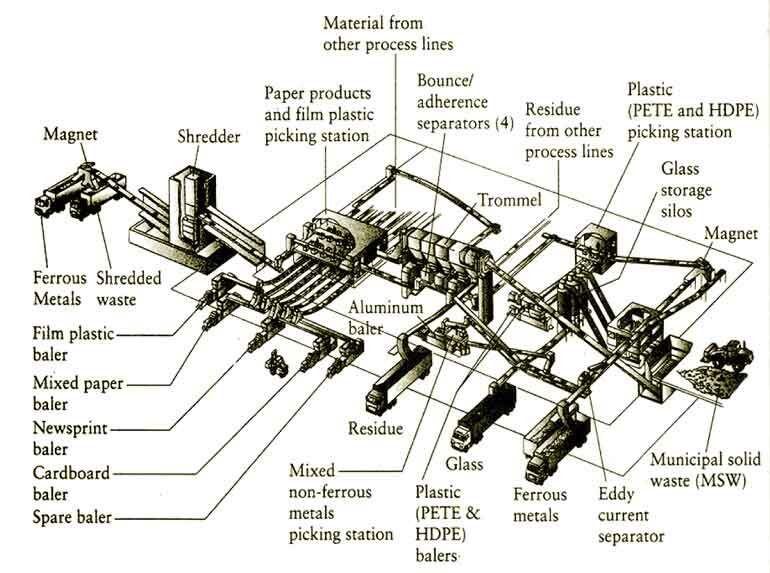 There is also the small issue of our waste not being quite suitable to such waste-to-energy systems due to calorific values being on the lower end which perhaps can be solved by avoiding recycling totally as paper and plastics, etc. are welcome to boost the calorific value. This requirement then comprises our national accepted strategy of 3R – reduce, reuse and recycle! However unsorted complex waste would require interesting materials such as activated carbon, ammonia and lime in air pollution control. Why incur enormous costs on expensive air quality treatment when spending differently on the front end of a biological process could give you several material streams for recycling? This too is given in a figure. When money is spent on the front-end of the process, there is economic gain and then the biological material could go on to provide at best biogas or compost only. Then there is no need for expensive air pollution controls. Some countries having invested in incineration systems in the early days carry on today with such schemes and such examples should not be lessons to us today. It is of course different when you own the processes and have the ability to manufacture the systems. Even then I would safely bet that when replace the ageing infrastructure, their choice of process would not be incineration. There is the need to identify some key performance criteria for citizens in the solid waste arena which would include national or regional recycling rates. When one see headlines of proposals and intentions one wonders where have all the knowledge and the learnings gone? There may be the situation that some of the heaps may contain tomes containing recommendations made on them – first to shelf and then to a bin and finally to a dump – sadly missing the understanding and the execution.